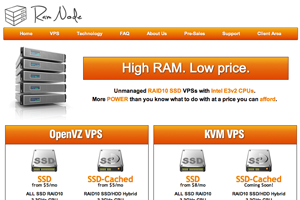 Nick from RamNode has eight exclusive offers for LowEndBox readers on OpenVZ and KVM plans in Atlanta. The coupon code “LEB35” applies to all of their vps plans on their site. RamNode LLC, were founded in July 2012 by the same people who created minecraftlayer. Whilst this is only RamNode’s second offer, they managed to finish an impressive fourth in our recent Top Provider Q3 2012 poll. Their last offer can be viewed here, it to received a lot of good feedback. In this offer, they’re offering 35% off for life, on all VPS plans; on both pure SSD storage and SSD Cached. There is a very interesting interview on serverbear about them and you can also view their serverbear benchmarks here. Hit more, to see a further six offers. RamNode LLC own all of their own IPs and have their own ASN. They accept payments through PayPal and Google Wallet. They have a 99% uptime guarantee and only offer refunds in special circumstances. They allow adult content, torrents, IRC and VPN; to read their full Terms of Service, click here and to view their Acceptable Usage Policy go to here. Many of you always want to know which operating systems the provider offers, well RamNode have a special page for that. Typical nodes are equipped with an E3-1230v2 Ivy Bridge Xeon Processor, Samsung 830 SSDs, WD RE4 or Seagate Constellation HDDs (for SSD-Cached plans only) and LSI RAID cards. Hope you would expand your services to west coast soon. It’s certainly on the to do list. I got the login details a couple of minutes after payment. So far so good, will keep you posted! I am still happy about the server, still quick IO and network response. I even got a pleasant surprise at the checkout, 256MB CVZ – Cached VPS has 40GB dist, and is listed here as 30GB! I had them update the offer to correct my space typo! Impressive deal; I’m actually considering buying one myself even though I work for Nick ;0! For the 3GB OpenVZ yearly plan you have it listed as 1TB BW but it is only 500gb at the check out. Yes, I thought the LEB guys caught that in their original review but I’ll ask them to update. Thanks! Ordered my second. Debian minimal template is best I’ve so far (3mb initial usage without any “crap”). Instant RDNS on both IPv4/6 is sweet too. Network and performance top notch too. Best <20$/y .us deal out there atm imo. Does it support tun/tap, l2tp, and nat module ? I’m interested for order also. Are there no 128mb KVM’s? Hi, I want to try this.I’m plannig to buy one for one year. If I wanted to renew it, what will be the renewal price for anuualy ? The discount will remain for the life of your service, so the same price. Purchased “128MB CVZ – SSD Cached VPS” two days ago. Live support was great at answering questions. Have had fun for the past two days playing with it. Nice control panel. Everything has been solid. Very happy with purchase. Make sure you’re using the Intel network card if that is Ubuntu. That download speed is very low compared to normal. how do I know the vps is using intel network card ? It will show you in the SolusVM control panel. Make sure you thoroughly review our KVM Guide which was linked in your VPS information email. Once I changed to Intel, the speed is better now. How long will the coupon valid for? I hope to get one of these deals in a week or two when my current VPS runs out. Where to apply the Promo Code? I didn’t find the place to enter it in the order link page. Or the promo was over? I performed a smoke test to compare the speed of RamNode and SecureDragon, by embedding a script that downloads a 64KB file from each server. Most of my visitors come from China, and others reside in United States. The result is: 86% of 1510 samples have faster speed from RamNode than from SecureDragon. @Nick, can I change the monthly subscription into yearly subcription on my existing service ? And does the promo code work on this ? Send in a billing ticket and we’ll see what we can do. just wanted to mention that I signed up for Ramnode earlier today, via this article, and it’s great so far. Blazingly fast! In first 2 offers 500GB bandwidth for year or per month ?? Just purchase for 256mb ssd vps. instant setup and performance is great. Just got the 1024MB SSD Cached. Instant setup was nice. Speeds are awesome, responds to everything supper fast. Definitely going to keep RamNode!